FLORENCE- The Pinal County Board of Supervisors today announces the July 1 launch of a discount card program to help consumers cope with the high price of prescription drugs. The county is making the free prescription drug discount cards available under a program sponsored by the National Association of Counties (NACo). The card offers an average savings of 20 percent off the retail price of commonly prescribed drugs. The cards, which will be available July 1, may be used by all county residents, regardless of age, income or existing health coverage. An estimated 59 percent of the county's pharmacies will accept the discount card, and a national network of more than 57,000 participating retail pharmacies also will honor it. "This will be a tangible benefit to all Pinal County residents," said Chairman David Snider. "The NACo prescription discount card will offer significant savings for the uninsured and under-insured residents of our county. Even those fortunate to have prescription coverage may use the card to save money on drugs that are not covered by their health plan. Residents do not have to be Medicare beneficiaries to be eligible for this program." Chairman Snider added that the discount card can also be used for pet medications that are filled at regular pharmacies. There will be no cost to county taxpayers for Pinal County and NACo to make these money-saving cards available to residents. "One of the best things about the discount card program is the ease of using it," said District 2 Supervisor Sandie Smith. "A cardholder will simply present it at a participating pharmacy. There is no enrollment form, no membership fee and no restrictions or limits on frequency of use. Cardholders and their family members may use the card any time their prescriptions are not covered by insurance." District 1 Supervisor Lionel Ruiz added that the savings will help those who are most vulnerable to the high cost of medications. "This card will offer up an average savings of 20 percent off the retail price," Supervisor Ruiz said. "I hope this card will help those who sometimes have to decide on buying food or their needed medications. People should take advantage of the savings this card will offer." The discount card program is administered by Caremark Rx, Inc. The Pinal County Board of Supervisors today announces the July 1 launch of a discount card program to help consumers cope with the high price of prescription drugs. Casa Grande, Arizona – June 20, 2008 – Expectant mothers are invited to the next session of Casa Grande Regional Medical Center's (CGRMC) Breastfeeding Basics Class on Saturday, June 28 from 9 a.m. to 11:30 a.m. This free class will include important breastfeeding information, as well as food and fun. To register, call CGRMC's Childbirth Education hotline at (520) 381-6543 or Diane Medina, Breastfeeding Coordinator with the Pinal County WIC program, at (520) 866-7292. CASA GRANDE- Board of Supervisors Chairman David Snider will be holding his monthly Maricopa office hours on Tuesday, July 1 from 9:00 am until 5:00 pm. Area residents are invited to visit the District 3 Supervisor if they have any issues they would like to bring to Chairman Snider's immediate attention. "I appreciate the courtesy extended to me by the City of Maricopa in allowing me to use their Interim City Hall in order to bring Pinal County government a bit closer to the people of the greater Maricopa area," Chairman Snider said. "These office hours have allowed me to learn more about the concerns of the residents and have given me the chance to explain some of the current issues and challenges facing our County. It's a win, win situation." If you would like to schedule a time to meet Chairman Snider on the 1st of July, please call his Casa Grande office at 520-836-0003, otherwise it is first come-first served. "We have just adopted our tentative budget for the 2008-2009 fiscal year," Chairman Snider said. "The property tax rate is the lowest we have seen in 31 years. It's a good, balanced and fiscally responsible budget, where we meet all of our obligations for services in Pinal County. We can discuss the upcoming budget or any other issue that is on the minds of northwestern Pinal County residents." A net tax decrease of 54 cents, thus establishing the lowest primary property tax rate in 31 years. The proposed primary tax rate is 86 cents less than the 2006 rate. Establishing Superior Court Division X to handle the increased caseload stemming from the county's rapid growth. Ensuring public safety by providing adequate funding for the Sheriff's Office, Detention and the Courts. Minimizing the use of the county's rainy day fund by making expenditure reductions across multiple departments and divisions. The proposed budget is $24.39 million less than the prior year's approved budget. Maintaining the financial stability of Pinal County. In December 2007, Standard & Poor's upgraded its debt rating for Pinal County to A. Standard & Poor's states the upgrade was earned as a result of "continued economic growth and diversification and maintenance of a strong financial position with strong reserves." Expanding library services for Pinal County residents. Construction of a replacement for the storm-damaged Schnepf Road Bridge. Completion of Park Link Drive resurfacing. Park Link Drive is an important east-west connector. "Significant impact for the county may come when we learn how the state plans to balance its budget," County Manager Terry Doolittle said. The tentative budget will be under review for potential adjustments over the coming weeks. The Board of Supervisors will vote on the final budget at their July 30, 2008 meeting. With the summer rain storms soon to be arriving, horse owners should take the precaution to vaccinate their equines against West Nile virus (WNV). FLORENCE- Is $4.00 a gallon for gas bringing your commute to work to a screeching halt? Would you like to share the pain at the pump? Pinal County government is now partnering with Valley Metro and other organizations to bring an online rideshare matching system to local commuters. "With the price of gas going up," said Pinal County Travel Reduction Coordinator Marie Frazier, "we have had a lot of people inquire about van pools and car pools. The interest has skyrocketed in the past few months. This site will help drivers find someone in their area who is going to the same location and match them up for a car pool." The site is very simple to use. A person seeking out a potential car pool simply logs in to search their area to see if another driver is looking as well. The Travel Reduction Program is dedicated to reducing the number of vehicles on the road, thereby reducing the amount of pollution coming from cars. The program is reaching out to other public agencies and private businesses. "The aim of the travel reduction program goes beyond Pinal County government employees," Frazier said. "We have been partnering with local government agencies and private businesses to encourage their participation in reducing vehicles on our roads. Employees of the Department of Corrections, Corrections Corporation of America, and the City of Florence participate in van pool programs." The Rideshare site is free to use. A year ago in the East Valley, the average price for a gallon of unleaded gas was $3.01. In the Tucson area, it was $3.00 a gallon. To increase fuel efficiency: change your air filter twice a year (a dirty air filter increases fuel consumption). Keep your tires inflated to the recommended pressure. Maintain a steady speed on the road (avoid quick starts and stops). Lighten up the load in your vehicle if possible. FLORENCE- The Pinal County Board of Supervisors addressed two possible changes to the Subdivision Regulations during a regular meeting in Florence. The Pinal County Subdivision Regulations, which were adopted in December 2006, address the conditions developers must meet to get a final plat by the Board of Supervisors. During Wednesday's work session, the Supervisors were informed of a proposed amendment to the regulations regarding the allowance of third party trust agreements in lieu of bond money as an assurance that infrastructure improvements will be completed in the development. Planning and Zoning attorney Nicole Weber said that other counties and cities in Arizona have utilized the same type of agreements with developers. "We have accepted cash, letters of credit and bonds," Weber said of how developers pay the assurance bond. "Under this type of third party agreement the property being developed is placed in escrow with a title agency and is held until the improvements are made. We do not take ownership of the land. We just sign the agreement with the trustee." The agreement would be made when the final plat is awarded, Weber said. Once the development is completed, county staff will inspect the property and submit a report on the improvements made to the project. If all the agreed upon improvements are made, the land is released back to the developer for sale to the public. If the developer is unable to make the required improvements, the county can abandon the land or replat it, if desired. Chairman David Snider asked if the county could release some of the lots to the developer once improvements are made to a portion of the development. "There is a maximum of three partial releases which may be allowed for each recorded plat," Public Works Director Greg Stanley said of the proposed change to the regulation. "Our thought is that 25 percent of the lots total in a single plat could be released." "I find your logic to be persuasive," Chairman Snider responded. "We ought to use that as a reasonable precedent." District Two Supervisor Sandie Smith asked the staff to examine a change to language in the agreement in the event that the development would be annexed by an incorporated city or town. "Would the developer follow our agreement or be subject to the annexing body?" Supervisor Smith asked. "I think the developer should follow the city's codes once the land is annexed." Weber said that staff would look into the matter and bring the Board an answer. The other change to the Subdivision Regulations would encompass modifications in a recorded project. Minor changes, such as technical errors would be forwarded to the Board of Supervisors rather than having to go back to the Planning and Zoning Commission for approval. Any major changes to the public infrastructure such as open space, school sites and public lands would be subject to a replatting. These would have to go back the Planning and Zoning Commission for approval before going to the Board of Supervisors. The Subdivision Regulation changes will be brought forward to the Supervisors at a later date for a public hearing. The Supervisors approved a name change to South Blewitt Road located north of Gold Canyon. The new name of the 990 foot roadway will be South Tonto View. The name change was initiated by citizens' petitions with 55 percent of the residents signing in favor of South Tonto View. The Supervisors approved an initiative to begin proceedings on the renaming a portion of East Aravaipa Road to East Old Camp Grant Place. The location of the road is north of Mammoth on Highway 77. The name change is hoped to reduce the confusion some people have encountered with the road and the trouble some have experienced with receiving packages. The name change will also honor the former Camp Grant Army post which was located near the road. Casa Grande, Arizona – June 11, 2008 – Casa Grande Regional Medical Center (CGRMC) invites the community to participate in an American Red Cross Blood Drive on Tuesday, July 1, 2008, from 9:00 a.m. to 3 p.m. To ensure minimal wait times, the drive will take place in two locations: the Encounter Room at CGRMC and on the Red Cross Bloodmobile in the parking lot. Registration will begin in the CGRMC Cafeteria. Come help us meet the critical blood shortage in Arizona and receive a free water bottle for donating. All blood donors are needed. To schedule an appointment, call Karen at (520) 381-6571 or go on-line to www.givelife.org and use the sponsor code cgrmc. Please make a difference and help save a life! San Manuel/Oracle, AZ – Sunday, June 1, Dr. Cheryl Wathier, primary care physician of SUN LIFE FAMILY HEALTH CENTER, completed The San Diego Rock and Roll Marathon, which benefits research and treatment for leukemia. Sharing the course with wheel chair participants, amputees, and more than 20,000 other runners, the 26.2 mile trek was Dr. Wathier's first. Among Dr. Wathier's more memorable experiences of the event were the running Elvis-s, The Marine Core marching band, and the numerous high energy local rock bands performing along the course. For her effort, Dr. Wathier received a finisher's medal, a bouquet of flowers, and some really sore feet. The greatest reward, she says, is the satisfaction of accomplishing a personal best in physical fitness. Citing notably lower instances of common ailments such as high blood pressure, heart disease, diabetes, and depression, in patients who exercise regularly, Dr. Wathier hopes her marathon experience will serve not only as an example to the SUN LIFE family of patients and staff, but also as an inspiration. Though Dr. Wathier's completion of the marathon is a noteworthy achievement, it is only the latest in a long list of accomplishments demonstrating her focused determination, ability, and willingness to serve and inspire others, that date back to her childhood. Graduating valedictorian from high school, Dr. Wathier went on to earn her BS from Michigan State University. Following a brief stint in retail management she was offered an opportunity at NASA. She readily accepted and began her first successful career as a configuration management analyst for NASA's Space Shuttle program. Dr. Wathier remained committed to NASA until 2003, when her mother, Sharon Wathier, was diagnosed with uterine cancer. Dr. Wathier left the agency to devote herself to the care of her mother and four younger siblings. Her mother's battle with the illness was brief. Dr. Wathier responded to the tragedy of her mother's passing by embracing a long held passion for healing, and enrolling in medical school. 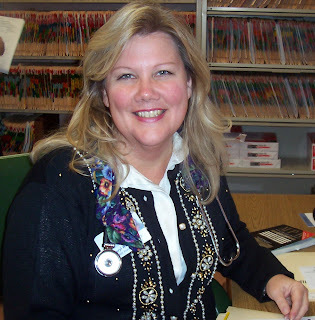 Dr. Wathier earned her medical degree from Arizona College of Osteopathic Medicine. After graduation and residency, she joined an Oro Valley medical group, where she practiced until the expiration of her contract required her to seek out other opportunities. The transition led her to SUN LIFE. After meeting with Al Gutierrez, one of SUN LIFE'S outstanding practice managers, Dr Wathier was sold on the practice. "Mr. Gutierrez's lead by example management style reflects his commitment to a harmonious work environment where the well coordinated and qualified staff share the common objective of providing the highest quality of patient care," says Dr Wathier. She joined the practice in November of 2007. FLORENCE – Winter rains promised the first truly outstanding wildflower bloom in several years. Mother Nature did not disappoint. But come June, July and August when the wildflowers are just a memory, all those green plants dry out and become wildfire fuel. By becoming Firewise,* you can protect your home and your community. Firewise people create "defensible space" around their homes meaning that you have a 30 foot perimeter of space around your home that is lean, clean and green. Lean means you prune back shrubs and tree branches within 15 feet of any structures. Clean means you clean out dead plant material from around your home. Green means you have planted fire-resistant vegetation and are keeping it healthy and green. Also, make sure your home is properly marked for emergency access, an entryway clear from flammable material. Most of all, have a plan in case you need to evacuate due to fire. Before you are confronted with an emergency, it's a good idea to have the following emergency plans in place. Be sure to take into consideration specific family health as well as the needs of specific family members who may suffer from disabilities or medical conditions. Post your local fire and police station numbers by your home phone and program them into your cell phone. Decide where you will go in case of a fire and plan how you will get there. Plan for your pets and their safety also. Dust mask to help filter air. Wrenches or pliers to turn off utilities. Battery or hand crank radio, extra batteries. Three day supply of non-perishable food. Learn more at www.ready.gov and www.firewise.org. With a controversial authorization bill poised for a final legislative vote, Arizona lawmakers are being assured that the state would not be liable for bonds sold to help finance a rock-and-roll theme park if the project goes belly up. The bill would require the project's backers to raise $100 million and secure financial guarantees for the $750 million bond issue by a special district. The bonds would be repaid from taxes on sales in the park, which would be exempt from property taxes and be in Eloy in Pinal County. While the state authorization would permit the project's unidentified backers to save on financing costs, lobbyists and legislative supporters promote the project as a jobs generator. Opponents criticize the proposed state involvement in a private venture and question whether any default on project bonds would cause fiscal trouble for the state down the road. However, the Legislature's law office said in a memo to the bill's sponsor that its wording "makes it very clear" that the state would not be liable for repayment of special-district revenue bonds. The memo also cited Arizona court rulings that found no state liability for revenue bonds not linked to the state's general treasury. Signed by a Legislative Council staff attorney, the memo was dated by May 14 but not widely disseminated before Tuesday, when the bill's sponsor cited it during discussion of the bill during a Senate Republican caucus. The Associated Press later obtained a copy of the memo, which serves as legal advice to the Legislature. Sen. Barbara Leff, R-Paradise Valley, cited media reports of questions being raised about potential financial responsibility for a state-authorized Wild West theme park that would be in Williams in Coconino County. Other senators assured her that the pending bill for the Eloy project is tightly written, with requirements placed on the backers and disclaimers for the state. "I don't see where the state is at risk at all," said Sen. Tom O'Halleran, R-Sedona. Sen. Ron Gould, R-Lake Havasu City, denounced the legislation as "fascism" and later said he might conduct a filibuster to block it. "I'm not down here to commingle government" and private business, he said. "If they can't stand on their own legs, it's got no business coming to government." Already approved by the House and Senate, the authorization bill (Senate Bill 1450) now awaits a final Senate vote, with passage sending the bill to Gov. Janet Napolitano. "It's on its way," the backers' chief lobbyist, Kevin DeMenna, said of the bill. The Senate's initial formal vote on the project was relatively close at 17-11 but DeMenna said some lawmakers have changed positions since then. FLORENCE – On June 4, 2008, three environmental organizations filed a lawsuit in the U.S. District Court located in Phoenix, Arizona, seeking to, among other things, force Pinal County to close a roadway that has been in existence for more than 100 years and that serves as an important transportation corridor into and out of the small town of Dudleyville. The lawsuit, filed by an attorney representing the Center for Biological Diversity (CBD), the Maricopa Audubon Society (MAS) and the Tucson Audubon Society (TAS), is based on false allegations with regard to the County's activities in maintaining the roadway and on misrepresentations concerning the ownership of the property on which the roadway is located. Pinal County will vigorously defend itself from the unfounded allegations in the lawsuit and will use its best efforts to ensure that the roadway remains open and available for use by the citizens of Dudleyville and to ensure that emergency (police, fire, paramedic) services can be provided to the public and visitors in a prompt and effective manner. The roadway, generally known as San Pedro Road, serves as the western gateway to Dudleyville, and one of only two roads into and out of the town. It has been located along the same general alignment for decades and is used daily by residents of the town and by school bus providers serving the children in the area. The road also allows for the most direct access across the San Pedro River into the town for fire and emergency medical providers. In their lawsuit, the CBD, MAS and TAS claim that the County has been "bulldozing in the stream" and "importing fill from outside the area," thereby "accelerating erosion and destruction of streamside habitat." Those allegations are untrue. The only "bulldozing" the County has done on San Pedro Road this year was to remove an earthen, rock-filled barrier that was illegally constructed across the road by landowners who are working in conjunction with CBD and the Audubon Societies. Those landowners excavated fill material from another landowner's property and dumped it at a point near where the road enters the west side of Dudleyville. After obtaining a court order authorizing its removal, the County used its equipment to push the fill material to the side and re-open the road. If anything illegal was done in these incidents it was by the landowners who excavated material from another person's privately-owned property and dumped it across the road. The environmental groups contend that one of their principal motivations for filing it is to protect the Southwestern willow flycatcher, a species of small bird, some of which have been seen nesting in the area. There is no need to close the road for the protection of the flycatcher, however, because the birds are not adversely affected by the roadway traffic. The flycatchers first began nesting activities in this area long after the road was open and being utilized by vehicle traffic. The birds have continued to populate the area even though San Pedro Road has remained open to public travel. "It is not our intent to try this case in the media," Supervisor Lionel Ruiz said. "At the same time, we want the people of Pinal County to know that we will vigorously defend against false allegations. This road is a lifeline in the event of an emergency and we intend for it to stay open." Ruiz is Supervisor for District 1, the area where the road is located. In prior meetings concerning San Pedro Road, County Supervisors have stated they will do whatever is within their power to ensure that the road remains open. It is not anticipated that the filing of this lawsuit will alter their position. They remain committed first and foremost to the safety of the residents in the Dudleyville area and will continue to operate and maintain San Pedro Road in an environmentally safe manner. L to R-Case Manager Gloria Valdivia, Horizon Home Care Director Donna Simpson, Direct Support Worker Rachel Padilla and Home Support Services Administrator Dr. Phil Putnam during a ceremony to recognize the efforts of Padilla to save a young man in Casa Grande. FLORENCE- What seemed like an ordinary Tuesday morning for Pinal County Horizon Home Care's Rachel Padilla turned out to be a life changing event for her and a young adult. Horizon Home Care provides home health and home support services for medical and general health needs. Padilla is a Direct Support Worker for Horizon who works in the Casa Grande area. "On Tuesday, May 20, I was taking care of a client in Casa Grande," Padilla recalled. "Suddenly we began hearing dogs barking from across the street. They were constantly barking, going on and on. They wouldn't let up." A family member of the client went to the door to see what the dogs were barking at and saw what appeared to be a person lying off to the side of the residential street. The family member, a son of the Horizon Home Care client, went out to check on the person to see if they were okay. "I watched him from the doorway," Padilla said. "I saw him checking for a pulse and then he started shaking his head." Another neighbor appeared from a house nearby with a cell phone in hand. "I started heading over there to see if there was anything I could do," she said. "The neighbor on the phone with 9-1-1 was yelling 'he's dead, he's dead.'" Padilla kneeled to check the young man, approximately in his late 20's, for any signs of a pulse. Feeling the wrist and then the neck, Padilla was not surprised to find the absence of any signs of life. "His skin color wasn't right," Padilla remembered, "he was gray and ashy. Just by looking at him you could see he was dead. It was hard to see at first, but I said to myself 'I have to do this'." Padilla's field training included a class in CPR. Her training kicked in and she knew she had to try to breathe life into the young man. "He was very, very stiff," Padilla said. "I was trying to move his neck, but he was really rigid." Another problem posed to Padilla was that the young man's tongue had swelled up, making it hard to perform CPR. "I couldn't get a breath into him," she said. "I kept on trying to move his neck up. I asked the woman on the phone to help me by pinching his nose shut. She was still on the phone with 9-1-1 while I kept breathing harder and harder, trying to get the air into him." "His whole body suddenly jerked which startled me. He started breathing again." Unbeknownst to Padilla, a small crowd gathered around her while she was performing CPR. "I thought there were only few people around us," Padilla said. "It startled me as they started clapping when the man began to take a breath. I really didn't know so many people were watching." The unidentified woman in communication with 9-1-1 relayed to Padilla that the operator's instructions were to keep breathing into him until the ambulance arrived, but not to apply compressions to the chest. "After about 6 breaths his color started coming back." The ambulance arrived soon after the man started breathing. Phil Putnam, Ph.D., the Home Support Services Supervisor for Horizon Home Services said that all Direct Support Workers receive CPR training before they head into the field. "It's amazing," Putnam said. "She had finished her training only two months ago and put it to good use." Padilla's efforts were recognized by Horizon Home Care's Director Donna Simpson. During a staff training session, Simpson awarded her with a certificate of thanks and a colorful plant. "She certainly is 'Horizon's Hero.' We are proud!" Simpson said. Following the short ceremony, Padilla said she was glad to have taken the training that allowed her to make a difference in another person's life. "It makes me glad that I was able to help the man out," Padilla said. "I have five sons and if they were to collapse, I would want someone to help them. I was thinking that if I wasn't around at the time this man might not have a second chance." Casa Grande, Arizona – The Reaching Out Support Group will meet on Thursday, June 12, 2008, at 5:30 p.m. in the Casa Grande Regional Medical Center Private Dining Room. Any breast cancer patient or survivor is encouraged to attend. The cost for dinner is $6.95 payable upon arrival. For more information, call Pauline at 421-1688 or Pat at 836-5390. To make a reservation, please call Linda at 381-6603. Welcome to the merry month of June! For many families it's the start of the summer season when the kids are enjoying a respite from the rigors of studying and parents are lamenting the lack of a respite from the work-a-day world that has long since stopped slowing down in the summer months. And for those of us who don't have school-age reminders of summer vacation time, there is always the lure of a dash to the coast or the mountains for a breath of cooler climate. Unfortunately, we all suffer from the inexplicable problems of working twice as hard in advance of the time off … and ten times as hard to catch up when we return to the workplace. But June is also a month of changes – and not just from 90 degree days to 110 degree days! The face of the Maricopa City Council will evolve as Mayor Kelly Anderson and Councilmen Kelly Haddad, Will Dunn, and Dallas Paulsen (sitting in for Steve Baker who moved out of Pinal some months ago for work-related reasons) leave office. Mayor Anderson and Councilmen Dunn and Haddad labored long and hard in the effort to create the City of Maricopa where there had been no city. Under the best of circumstances, giving birth to a city is no easy or simple task but these gentlemen gave it their all over the past five years and they deserve our thanks for their time and dedication. And Councilman Paulsen gets kudos as well for having stepped up to serve his city in its time of need – he put in endless hours of research and meetings to do his best on behalf of his neighbors in Maricopa. These retiring gentlemen in Maricopa will be succeeded by a new group of faces, led by Mayor Anthony "Tony" Smith. Joining him in the Council hot-seats will be Marquisha Griffin, Marvin Brown, and Carl Diedrich. I wish them all the best in their pursuit of excellence in public service and commit to them that Pinal County will be there to work with them as we face the challenges of growth, development, economic development, and change. Last month's election in Coolidge clearly proved that one vote does count! Although incumbent Mayor Tom Shope ran unopposed, the Council race came right down to the May 20th General Election wire and then went past it. In the primary election, Randall Rushing and incumbent Judy Rotz-Lopez were summarily elected to the City Council; however, Emily Verdugo-Aldrich and Lester Curry faced off on May 20th – Mr. Curry had a one vote edge over Ms. Verdugo-Aldrich with a write-in vote and a contested ballot. After a review of the balloting, a tie was declared. The matter was decided at the June 9th City Council meeting as the "old" council adjourned sine die and the new Council assumed their duties. I'd like to note that Council members Paul Prechel and Bonnie Palmer have each served Coolidge for nearly two decades and deserve the thanks and gratitude of their constituents and the larger Pinal County community. I had the pleasure of attending an event at the Francisco Grande last month in celebration of Older Americans Month. Organized by our twin towers of strength, Olivia Rodriguez and Mary Lou Rosales, the event brought together representatives of Chambers of Commerce from Pinal and Gila Counties as well as members of the Pinal-Gila Council for Senior Citizens to explore the issue of the mature worker and their impact on Arizona's workforce and economy. Governor Janet Napolitano took a break from her work with the legislative leadership on the FY 2009 budget to address the assembled group and talk about programs that her office and the State Legislature have put into place for older Arizonans. The event was a great success with a number of elected officials also in attendance. One more note on this column's theme of change. Last month marked the official retirement of Marge Jantz from the Casa Grande Main Street program. She arrived in town nearly a decade ago to assume the reins of the program on the heels of Donna Renninger. Marge's style was considerable different, but her attention to detail and her passionate embrace of things-Casa Grande were a potent combination. It's clear that Casa Grande's downtown is a better place for having her small but vibrant hand on the steering wheel. I'm pleased that she'll continue to be a part of our local and county community despite her determination to retire from the Main Street program. Thank you, Marge! At the top of this column, I spoke of the summer months and children being released from the bonds of the classroom. I want to take this opportunity to urge everybody to drive extra carefully in residential neighborhoods because kids don't look when they're playing in the front yards of our neighborhoods. Please, if you have a pool, don't relax your vigilance: even two seconds of inattention can be fatal for young ones who are naturally fascinated by water. Let's all get through this 2008 summer time without a fatality due to drowning in a backyard pool. Finally, here's my sincerest Happy Birthday wish to the United States of America! This July 4th marks the 232nd birthday of our beloved country and I know we'll be gorging ourselves on all the typical food groups while looking toward the skies at dusk for fireworks. As you do so, please join me in thanking all those who have served or who are currently serving our country in all branches of the US military. Thank those who serve and protect us here at home – both police officers and fire fighters. Thank those who work so hard to make our country's economy strong and vibrant and those who teach our future generations the truths that keep us free. God Bless America, Arizona, and Pinal County. The third of four provocative sessions focused on Water related to the new Pinal County Comprehensive Plan was held Thursday, May 29, 2008 at Central Arizona College. George Fletcher, President and CEO of Replenishment Services, and Dr. Jack August of the Barry Goldwater Center for the Southwest, both noted that water is the only necessity of life that is easily captured and portable. It is this fact that allowed Arizona to be populated for generations, and today, a desirable place to live. Fletcher noted that water is not a constraint for Pinal County today, and that new water will come to Arizona and to Pinal County for the future when the economic pressures demand. What is important today is to understand what the potential for the future of Pinal County may be, and to plan and advocate for all the resources needed to realize that future. Fletcher noted that what is important for Arizona now is how to best manage what water we currently have. "Pinal County as an agency lacks the legal authority to manage water," Fletcher said, "but the county can support water resources management through additional messages concerning conservation, and advocacy on behalf of all who live, work, and play in Pinal County."